I own the XL in red, the MD in black and the SM in red. The Granite Gear drysacks are waterproof sacks made of 70D nylon ripstop material with tape-sealed seams. They are available in a variety of sizes from 7L to 33L (425 to 2,015 cu in). The top closure is a roll-top. The shape is somewhat rectangular to help with packing more efficiently in a pack. The top opening has an arched rolling stay to help hold the top open while loading. The inside has a white pigmented coating to improve visibility while searching for my gear inside the bag. 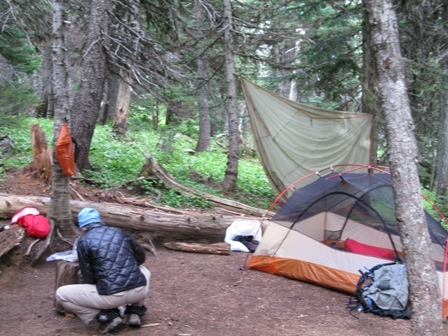 I originally purchased these sacks for a trip to Mount Rainier to hike the Wonderland Trail. Since rain is usually a given in the Cascades I wanted to make sure that my down sleeping bag and clothing would remain dry throughout the trip. I can usually get by with a plastic bag backpack liner in the Sierra Nevada. I purchased the XL size for our double-wide sleeping bag, the medium and small for clothing and essentials for both myself and my husband. The photo shows the red XL bag in the tent, the black MD bag left of the tent and the red SM bag at the left side. Overall one or all of these sacks have spent approximately 25 days on the trail. Wonderland Trail, Mount Rainier National Park, Washington; 10 days; 100 mi (161 km); 2,600 to 7,200 ft (792 to 2,195 m) elevation; 32 to 62 F (0 to 17 C); clear to foggy to downpour conditions. Ohlone Trail, Diablo Range, Northern California; 3 days; 30 mi (48 km); 390 to 3,800 ft (119 to 1,158 m); 36 to 60 F (2 to 16 C); varying from clear to snow to blowing sleet and hail. Loon Lake, Sierra Nevada, California: 2 days, 10 miles (16 km); 40 to 65 F (4 to 18 C); 6,327 to 6,500 ft (1,928 to 1,981 m) elevation; late season snow on ground. Shadow Lake, Sierra Nevada, California: 2 days, 15 miles (24 km); 40 to 75 F (4 to 24 C); 6,560 to 7,940 ft (2,000 to 2,420 m) elevation; late season snow on ground. Sequoia National Park, Sierra Nevada, California: 6 days, 60 miles (97 km); 38 to 84 F (3 to 29 C); 6,700 to 11,600 ft (2,042 to 3,536 m) elevation; dry conditions. Bucktail Path, Elk State Forest, Pennsylvania: 2 days, 15 mi (24 km); 2,100 to 2,700 ft elevation; 55 to 70 F (13 to 21 C); wet conditions. When I purchased these drysacks I didn't get to choose the colors so I ended up with two different sizes in the same color. I would have preferred for them to be different so that it would be easy to identify them but it hasn't been a huge problem. The XL is easy to identify due to its voluminous size and the smaller bags are different colors from each other. 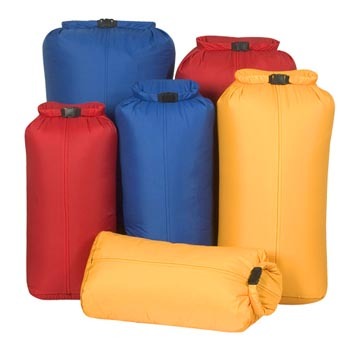 The XL size is really large but our double-wide down sleeping bag fits inside just right with room enough to compress it and roll the top closed. The small is the most often used and typically holds clothing for one person for a multi-day trip. It has also been used for essentials like headlamps. The medium is often used for clothing for two people for shorter trips or for one person for a long or cold weather trip. It has also been used to hold food when a bear canister was not required. The sacks are well-made easy to use. I can stuff in quite a lot of clothing without fear of straining the seams. I have to leave some space at the top for rolling the closure. So I jam in my clothing, kneel on the bag to expel as much air as possible from my clothes and then roll the top. If I don't expel enough air then the sack bulges as I try to stuff it into my backpack and I have to remove it and start over trying to expel more air. If I do a good job of expelling the air then I'm ready to pack the sack into my backpack. Granite Gear claims that the sacks hold their block shape but if I expel air then they really just take whatever shape they ended up from my kneeling on them. However, they're easy to pack and I don't have any problem with how the shape ends up. When I pack food inside I can't kneel on the sack so I just do my best and leave the sack in a more bulky shape. My husband and I have both used the sacks as a pillow and the small and medium sizes worked well for this. Since they are air tight I can leave as much air inside as I like for comfort. The sacks proved their waterproofness at Mount Rainier during a 20 hour period of the heaviest deluge that I have ever spent outside. It rained hard without any slack starting at 8:00 AM just after we hit the trail until 4:00 AM the following morning. We hiked in rivers of rain all day and set up camp in the driest spot we could make after draining the pool that was our designated campsite. Everyone else except one hardy couple had hitchhiked out that day! We were thrilled to get inside the tent atop our air mattresses (aka rafts) and pull our DRY down sleeping bag out and our DRY clothing. The bags have also been used to hang food overnight when bears were a minor threat (otherwise we use a canister). Although our food is always inside zip-top bags anyway, it was still nice to have a sack that didn't get soaking wet from rain or dew overnight. I could just shake it off and it would be dry enough for packing other gear inside for the trail. The Granite Gear drysacks have been a convenient and reliable way to pack gear that needs to remain dry on the trail. They have proven themselves to be effective and are a reasonable weight for the price.